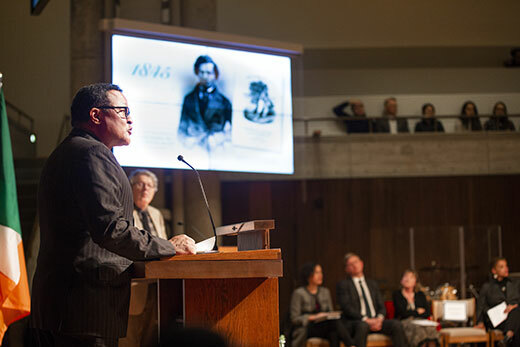 Dramatic readings of lectures originally given by abolitionist and orator Frederick Douglass, presented at an event Nov. 27 at Emory’s Cannon Chapel, struck a chord with contemporary listeners just as they did more than 130 years ago. Emory Libraries and the Stuart A. Rose Manuscript, Archives and Rare Book Library partnered with the Consulate General of Ireland in Atlanta for “Frederick Douglass: A Bicentennial Tribute,” an event celebrating the 200th birthday of the abolitionist, author, statesman and orator. The event drew about 175 people from the Atlanta and Emory communities. Presenters read narratives and excerpts from a selection of Douglass’s lectures, which included “American Prejudice Against Color” given in Cork, Ireland (1845), “4th of July Speech” in Philadelphia (1852), “Address for the Promotion of Colored Enlistments” in Philadelphia (1863), and the address delivered before the National Convention of Colored Men in Louisville, Kentucky (1883). Patrick Finley, a fiddler from Atlanta, provided interlude music, and Jeremy Hathcoat, from Fayettesville, Georgia, sang an Irish song to close the program. Parts of the lectures resonated with the audience as the speakers gave passionate readings, even drawing laughter several times as parallels to recent political events became pointedly obvious. In the 1845 speech read by Morris, Douglass recalled he was accused of lying as he spoke out against slavery to a crowd containing several slave owners. He offered instead to read a law passed by southern legislators: “This raised a general clamour, for they did not wish the laws exposed. They hated facts…,” sparking laughter from the Cannon Chapel audience. The event was part of a wave of celebrations by Irish consulates across the U.S. this year, commemorating Douglass’s 200th birthday and his relationship to Ireland. Born as a slave, Douglass, who died in 1895, did not know what year he was born, but historians have estimated the year as 1818. He escaped as a young man in Maryland, writing and speaking out against slavery and becoming well known as an orator and abolitionist. During his lifetime, he published three autobiographies, held public office and published an abolitionist newspaper called the North Star. Douglass traveled to Ireland in 1845 and 1846 for a lecture tour, shortly after the publication of his book “Narrative of the Life of Frederick Douglass, an American slave.” He was warmly received and developed an affinity for the country. The readings closed with a video of Oscar-winning actor Louis Gossett Jr. reading “The Passing of Douglass,” a poem by W.E.B. Du Bois on the occasion of Douglass’s death on Feb. 20, 1895, recorded especially for the tribute event at Emory. Gossett was slated to read the poem in person at the event but was unable to attend due to a scheduling conflict.